Peyton Primack (62) takes a recovered fumble into the end zone for a first play score for Ipswich. QB Connor Wile was sacked on the first play but recovered to throw three TD passes and a 2 point conversion. 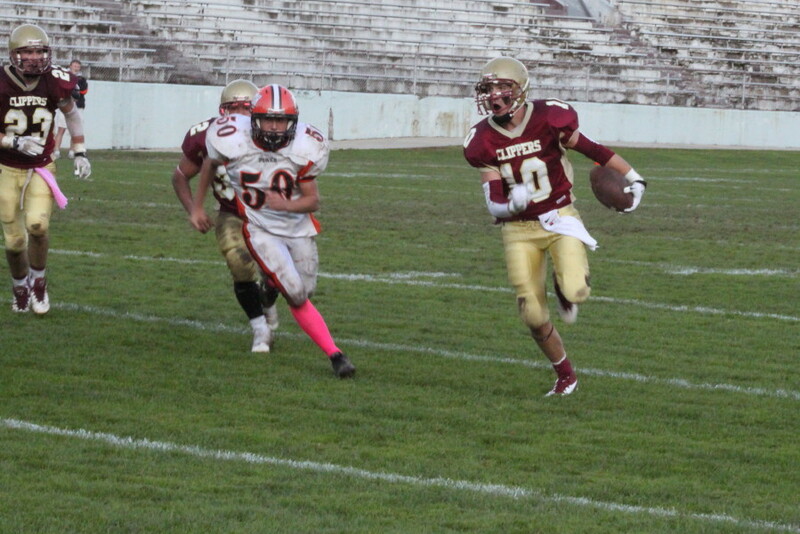 (Newburyport) One play in the Newburyport Clippers didn’t know what hit them…………especially quarterback Connor Wile. 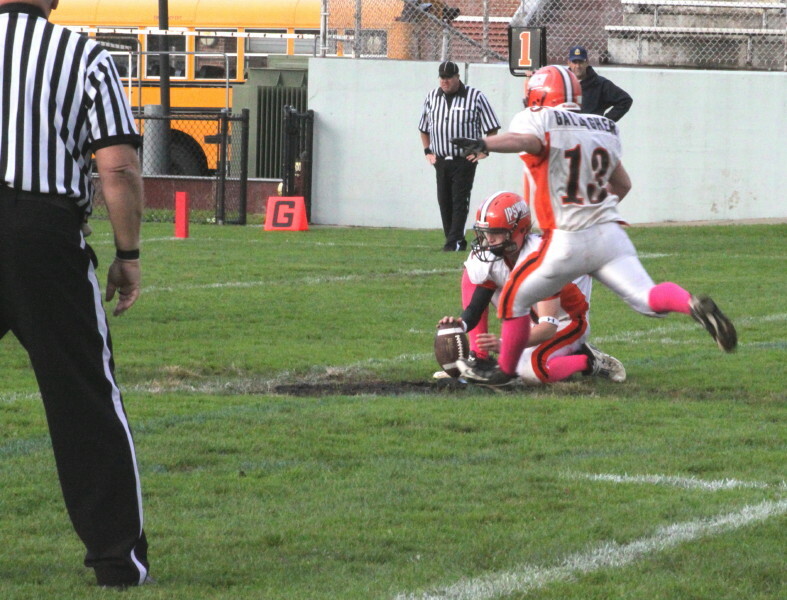 The Clipper QB ended up on all fours as the visiting Ipswich Tigers celebrated in the end zone. That was the start but thereafter the Clippers straightened out their pass protection and scored at will to defeat Ipswich, 34-14, at War Memorial Stadium on Saturday afternoon. But if you want to lose a quarterback, allow a full-speed defender a clean shot from the QB’s blindside as he‘s back to pass. But that’s what happened and the hit caused Connor to fumble. Tiger Peyton Primack found the loose ball and took it 25 yards into the end zone. 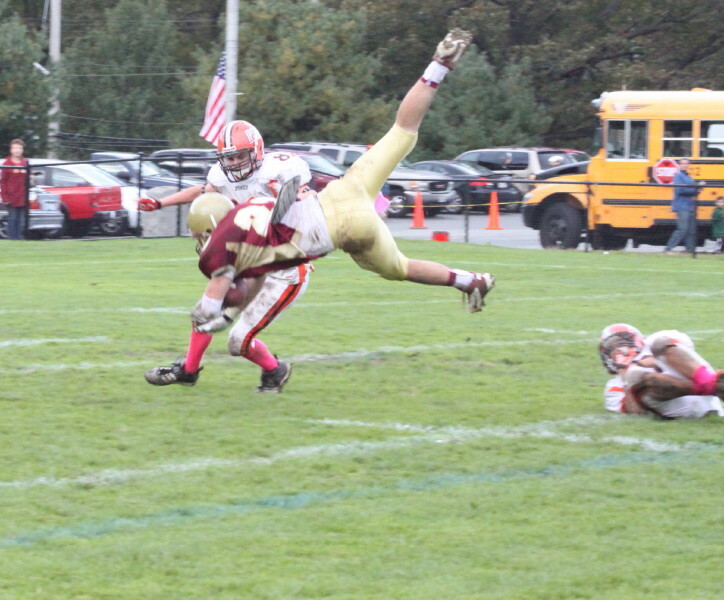 Brenden Gallagher’s extra point kick (Nick Andreas hold) put Ipswich (1-4) in front 7-0. This all turned out to be very misleading. The thoughts that Newburyport might be less inclined to pass or that their offense would be limited, vanished by halftime. For by then the Clippers (4-2) had put up four touchdowns – two on the ground and two in the air – and were in command, 27-14. Tyler Martin (32) goes 47 yards for first quarter touchdown. Connor’s protection was superb after that first disastrous play and the only times he went down were when he decided to scramble. Newburyport operated out of the shotgun most of the time and spread the field with receivers (Brett & Colton Fontaine, Ian Michaels, and Jimmy Conway) that every scout (I saw Triton in the stands) is well aware of. 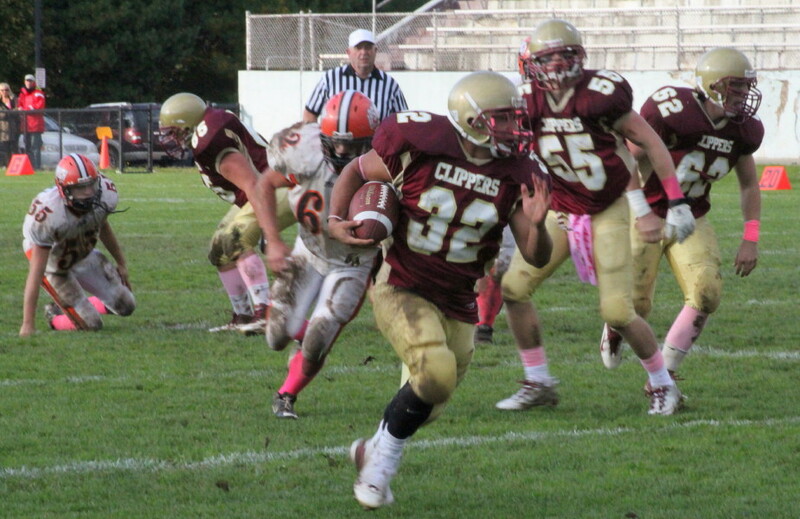 When Ipswich over-concentrated on pass defense the Clippers ran speedy Tyler Martin up the inside. On this day, Ipswich was seriously burned by both forms of attack. Tyler Martin got them first. On a 3rd-and-21 from the Ipswich 47, NHS sent Tyler up the middle on a draw play. Tyler stayed in the middle briefly and then cut right and sped to the end zone. Brandon Trego’s kick was good (Tyler held). So 3 ½ minutes into the first quarter, the Clippers were even. 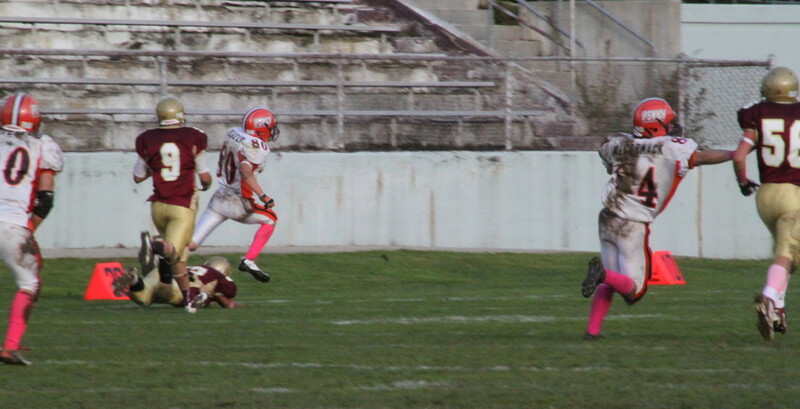 Clear sailing for Brett Fontaine (3 TD catches) as Tiger defenders Louis Galanis (10) and Pat Curran collide. Next possession, Newburyport struck through the air. A harmless looking pass in the flat to Brett Fontaine did the trick. The Tigers’ first defender (John Elnagger) missed the tackle and the next two defenders (Pat Curran and Louis Galanis) took each other out – Louis slipped into Pat. Brett ended up with a clear 65-yard route to the end zone. Brandon Trego’s kick was wide but Newburyport was ahead, 13-7, with 4:19 left in the first quarter. Next possession, Newburyport moved deep into Ipswich territory early in the second quarter. They reached the Tiger 7 before a Connor Wile pass intended for Brett Fontaine ended up in defender Nate Glaster’s hands. Off the fast sophomore went down the left sideline on a 93-yard TD run. Brenden Gallagher’s kick gave Ipswich a shocking, 14-13, lead with 9:10 left until halftime. Nate Glaster (80) finishes a 93 yard interception return touchdown. The thought at the time that Newburyport was just overly pass happy and needed to shelf that attack never seemed to be a consideration for the NHS staff. The Clippers moved back down the field with a collection of passes and rushes. A pass interference call helped greatly. Tyler Martin provided the finishing touch with a 6-yard burst up the middle. The kick was missed but Newburyport was ahead, 19-14, with 5:43 until the half. A bit of trickery by Ipswich (fake punt by Louis Galanis) got them into Newburyport territory but the defense refused to give up any big plays from the line of scrimmage and the Clippers took over late in the half. Again it was passes that quickly moved the Clippers close. Connor Wile connected with Brett Fontaine for the score on the right side in the last minute from 8 yards away. The pattern looked a lot similar to the one that had resulted in an Ipswich interception (TD) at the start of the quarter. The Clippers went for two points. They faked Tyler Martin up the middle (I was fooled by it!) and then Connor hit a very wide open Jimmy Conway in the right corner of the end zone. This gave NHS a 27-14 lead at the half. The second half started with turnover, turnover, and turnover. 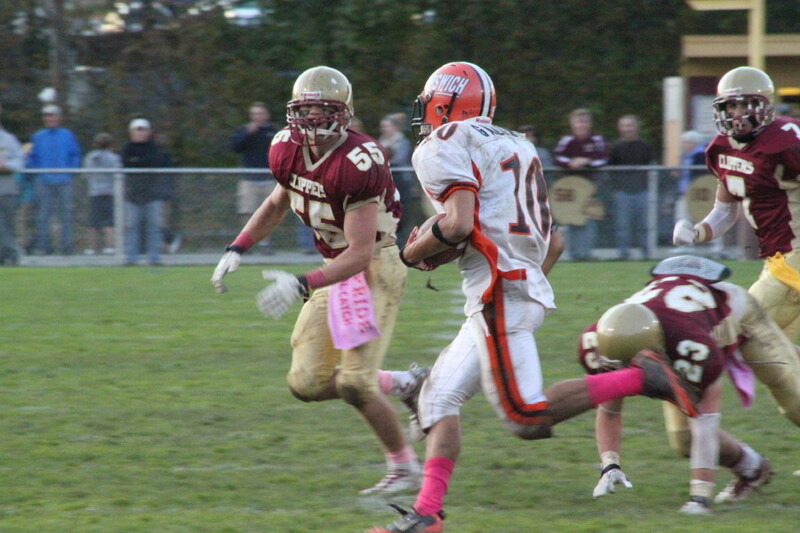 Connor Wile was intercepted (Nate Glaster) while Ipswich fumbled twice. 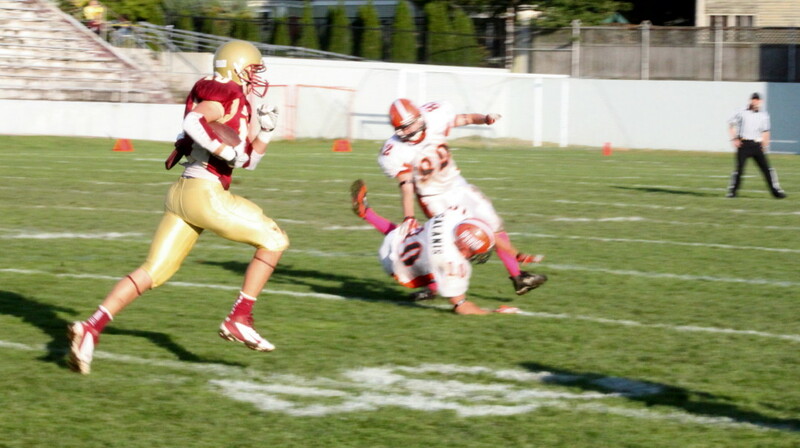 The second Tiger fumble was recovered by Tyler Souther at the Ipswich 12. Way too delectable field position for the Clipper offense on this day. Brett Fontaine catches TD pass despite face mask infraction in third quarter. NHS struck quickly as Connor hit Brett in the end zone. Brett hung on despite suffering one of the more blatant face mask penalties you’ll ever see. Brandon Trego kicked the extra point to put the Clippers further ahead, 34-14, with 7:34 left in the third quarter. And that turned out to be the final score as a lot of clean jerseys were seen the rest of the way. 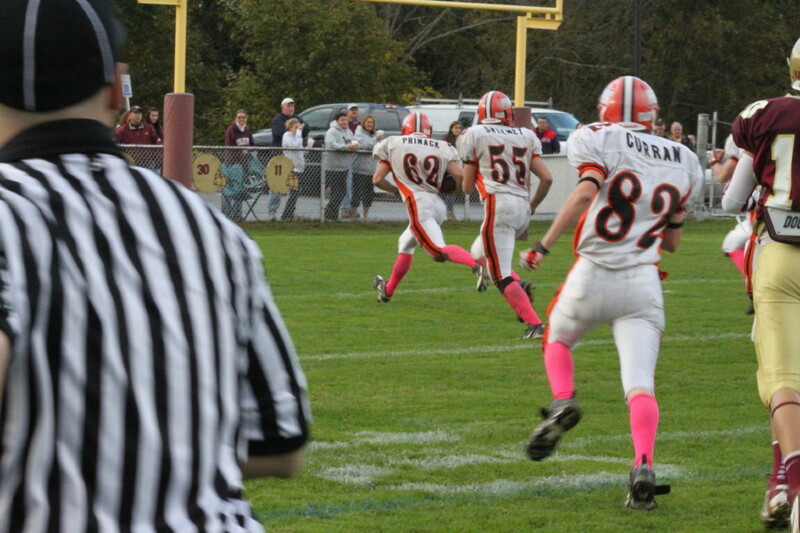 Credit Newburyport for sticking with a passing attack throughout the game. Credit center Kyle Monahan for enabling the Clippers to function out of shotgun formation with a game of clean snaps. Connor Wile might be a little tougher than your average high school quarterback. In the winter he’ll be seen playing hockey and in the spring catching for the NHS baseball team. Point? He’s no stranger to contact! The weather was full of surprises. A half hour before game time it was pouring. Thereafter we saw clouds and even some sun………only in New England. 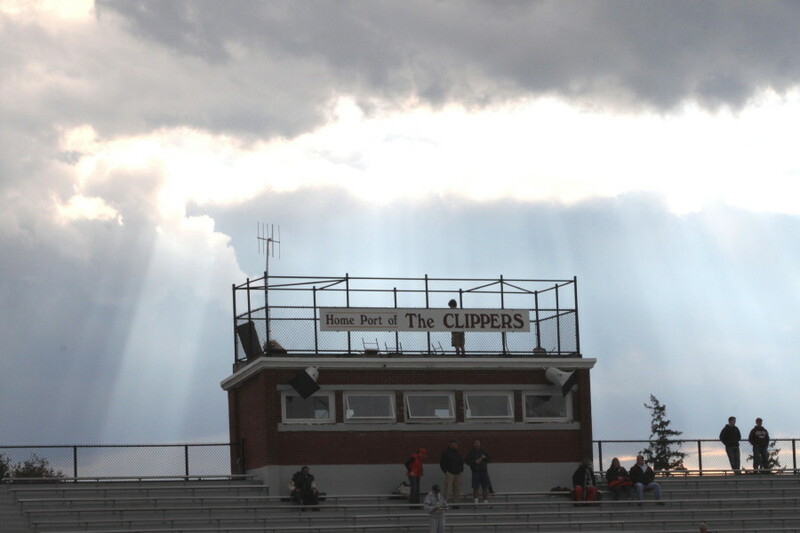 The Clippers face Saugus at NHS next on Friday night (7PM). Ipswich gets Lynnfield at home on the same night. The rest of the way the games are league games. Quarterback Nick Andreas sits on sideline with trainer Nicole Tougas and IHS coach Ted Flaherty. Tiger freshman quarterback Nick Andreas was hit hard in the third quarter and didn’t return. Sophomore Kyle Blomster took over the rest of the way. 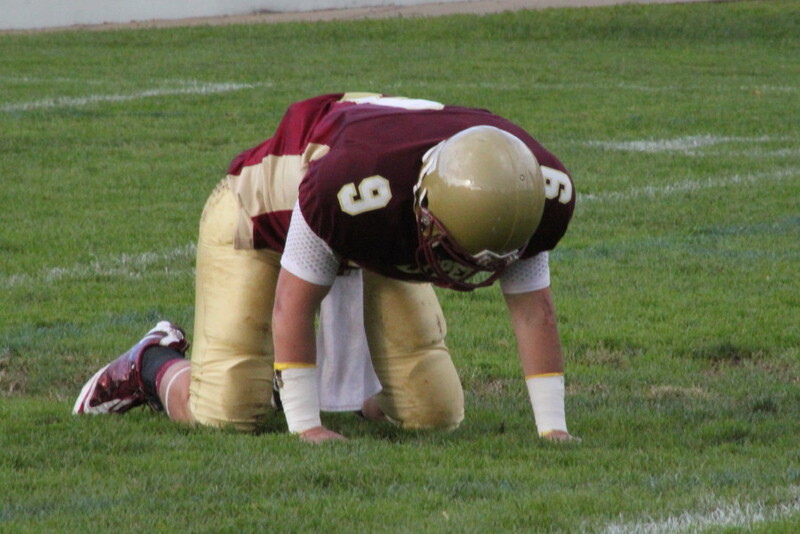 Clipper junior Tyler Cusack was hit hard during kickoff coverage in the second half and didn’t return. The pictures will enlarge to normal size if you click on them. Enjoy. Jimmy Conway flies after hit.